I didn’t grow up eating Asian food. My family is pretty much born and bred Southerners…hillbillies, my parents like to say…and we ate a standard Southern American diet while I was growing up, with an occasional spaghetti, pizza, or taco night. My introduction to Chinese food was with my high school speech and drama team. We had gone to the state finals in a Chicago suburb, and our coach arranged for us to have dinner at a nice Chinese restaurant. The food was good and I had my first opportunity to try eating with chopsticks. So at 17, I got hooked on Chinese food. Then while living in Saipan, I was exposed to a broader range of Asian foods and became enamored with the variety of flavors. This dish is a favorite that I’ve been making for years, and my kids love it, too. It’s one of those easy dishes that I can whip up on short notice because I almost always have all the ingredients on hand. Slice chicken breast across the grain into strips about 1/4 inch thick. In a bowl, toss the chicken with the cornstarch, sherry, salt, and pepper. Make sure it’s coated evenly. Set aside for 10 to 15 minutes. Pour about an inch of water into the pot and put the steamer basket in. Cover and bring to a boil. Place broccoli florets in basket and steam just until the color starts to shine, about 3 minutes. Turn off the heat. In a wok, heat oil over high heat for about a minute. Add garlic and ginger and stir-fry for just 30 seconds. Add the chicken and stir-fry until it is white and opaque, about 3 to 5 minutes. Add the broccoli, soy sauce, oyster sauce, chicken broth, and sugar. Stir-fry until broccoli is tender and heated through, about 2 to 3 minutes. I’ve seen many different version of this dish. Some call for onions, scallions, or water chestnuts. Others add an egg white or a tablespoon of vegetable oil to the chicken marinade. And others toss the broccoli into the wok raw. I used to toss the broccoli into the wok raw, but I found that steaming for just a couple minutes actually helped finish the dish better. Otherwise, the broccoli takes longer to cook and you have to remove the chicken before stir-frying the broccoli so that it doesn't overcook. Very nice blog, great pictures. This was a great recipe. My son and I love this dish. I was surprised how easy it was to make and the it was very good. I did not have oyster sauce and I substituted a little rice vinegar for the sherry. Still, it was great. Thank you for the recipe. I made this to the tee, but I only had full sodium soy sauce. It was way too salty for my family. I definitely will make it again, but with low sodium soy sauce and may even cut the salt in half! The flavor however was good! I would have to agree on the salt. I only use low sodium soy sauce because I find the regular kind to be overly salty for my taste, and over the last few years I’ve cut back on the amount of salt I use in my dishes. I have a question, I know what flavors All the other ingrediants will impart on the dish except the oyster sauce. Is this vital or not as if I make this for my family, my mother is alergic to shellfish and and I would like not to subject her to it. Hi Jen. Cooking with food allergies can be tricky! The oyster sauce lends a slightly sweet and salty flavor, so for a substitute I would increase the soy sauce (1 additional tablespoon) then add 1 tablespoon water and 1 additional teaspoon sugar. I made this dish to the letter last night. I found ALL the ingredients at the Super Walmart near my job. The results were FANTASTIC!!!!!! I will be sharing this recipe with all I know who enjoy chinese dishes. THANK YOU SO MUCH FOR SHARING THIS RECIPE. you can get around blanching the broccoli by stir frying the broccoli for about a minute, then push the brocoli up the sides of the wok and toss a couple tbs of water into your wok and and cover very quickly. it will steam and you wont have to dirty another pot. The steaming process only needs a few seconds to get it to where you want. I prepared this dish and it was/is amazingly delicious.The oyster sauce really pushes the flavors here.Authentic chinese.love it! Sorry to say, I didn’t follow every detail. I was looking for a simpler recipe. But, it served as a great guide. 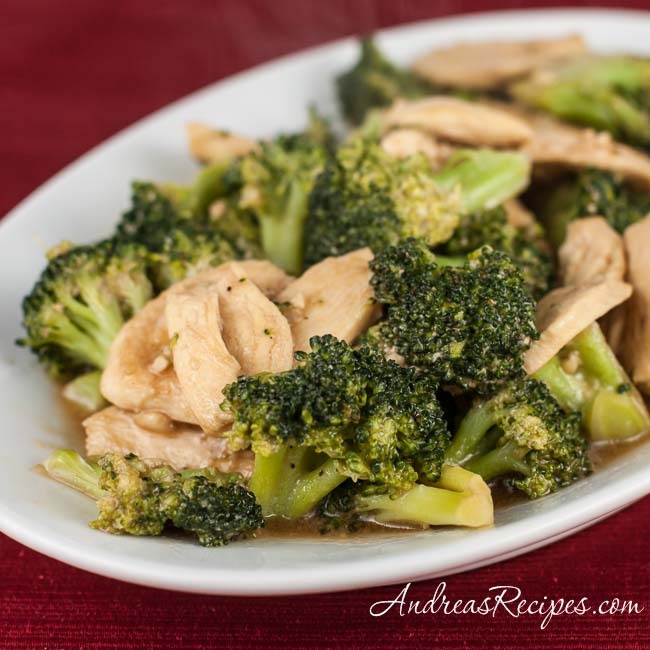 I improvised and achieved what I was looking for – first time chicken and broccoli. For the person who did not want to use Oyster sauce: Try Hoisin sauce. It’s very similar without any seafood ingredient.